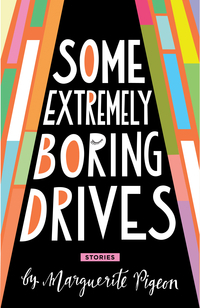 From the multi-talented author of Inventory and Open Pit comes a new collection of short stories, filled with lost souls drifting through exotic locales, reinventing themselves on the fly. Marguerite Pigeon’s gifts for quick characterization and muscular dialogue are on full display in this collection, where you will encounter competitors in an endurance race at the edge of the world; the secret lives of stray cats, and those who try to catch them night after night; an interview with a once-famous musician who seems to be losing touch with reality; a date in Mexico City that ends in a kidnapping; a woman who comes face to face with her mirror image and finds that she’s taken another path; and a girl who’s determined to never, ever stand still again. Marguerite Pigeon is a former journalist and traveller turned writer of fiction and poetry. In 2001 she lived for several months near the Honduran-Salvadoran border working with a local indigenous organization, an experience that became the inspiration for Open Pit. She later attended UBC’s Creative Writing MFA program. Since graduating, her short stories and poems have appeared in journals throughout Canada and internationally, and her first book of poetry, Inventory (Anvil 2009), was nominated for the Gerald Lampert Award. Originally from Blind River, Ontario, she currently lives in Vancouver. 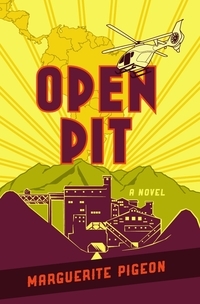 Open Pit is her first novel..